Hi again, it’s Andrew Mazer from Small Business University where the philosophy is one good idea can change your business and change your life. If you know me at all, you probably know my, my background story that I’ve been a wholesaler since 1986. I started my own wholesale company years ago and through that business experience and learning how to market my business and various ways, especially marketing online has giving me a rather thorough experience so that I have become a marketing consultant. And then that’s how Small Business U. was born. So today I’m going to talk about firing customers. Sometimes you have to fire customers, and this is a delicate situation, but it is also very important. 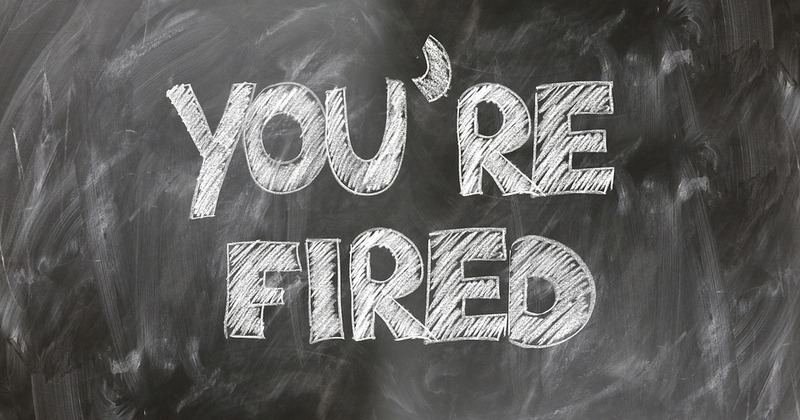 I fired a customer today, customer of my wholesale business, because he was wasting too much of my time. I don’t take a big thrill in this, but sometimes, it’s necessary. Have you ever been in the situation where a customer who’s costing you way more in time and aggravation than the customer’s worth? If so, it’s a real good reason to fire that customer. Of course, you have to do it in a tactful and gentle way. In this particular case, the guy was a very small customer. Don’t get me wrong, small customers are okay. I like doing business with small customers too. Sometimes when you’re not busy and you get one of those small orders, it’s better than nothing. But this guy always required a negotiation over a couple of boxes of trash bags and negotiation over an already inexpensive item and he doesn’t even need to order a lot of them. So anyway, he wants to negotiate, ask a lot of questions, ask why is the price is higher than the price from 2 years ago. I actually think this guy is a very successful, actually. He’s not stupid. I believe this because I have an idea of where he lives in a very affluent neighborhood. I think he’s pretty well to do. But when somebody is costing me, hours or more to process to finalize and process a small order and he’s taking up that much time for me, it’s really taking away opportunity cost. When somebody takes you away from other opportunities, you can lose valuable time your could be doing something more valuable or productive. I’d be better served taking 20 minutes to meditate than 20 minutes to go back and forth with this guy’s emails, questions. and special requests. So when something is that aggravating to you and takes away that much opportunity that you could be doing something more productive than it’s, it’s wise to gently get rid of the problem. You don’t want to do it in a way that the guy ends up giving you a bad review or, or blabber mouth into people. But generally speaking, you’re pretty safe in doing this as long as you don’t become belligerent about it. I’ve fired people before that were just, a real pain in the neck and made life and business miserable. This even applies if customers make your employees miserable. Protecting a good employees from the pain of dealing with a bad customer will nourish your relationship with them. Don’t be afraid to get rid of those customers who are pulling you or your people down because it’s also pulling your business down, and pulling the life out of your day. If you’ve been thinking about firing customers before, if you’ve ever been on the fence about it, it’s okay to do it. Just be gentle and thoughtful about it. Be as polite as possible. I’m Andrew Mazer for Small Business U. You check out our blog and sign up for our The One Good Idea Newsletter for more ideas about marketing, management, motivation, and technology. See you next time. Tell a friend. I don’t know who said it first, I think I heard it from Joe Polish. The saying is, “Marketing is everything and everything is marketing.” In this case, marketing is what happens when the bill has been paid and the transaction is completed. 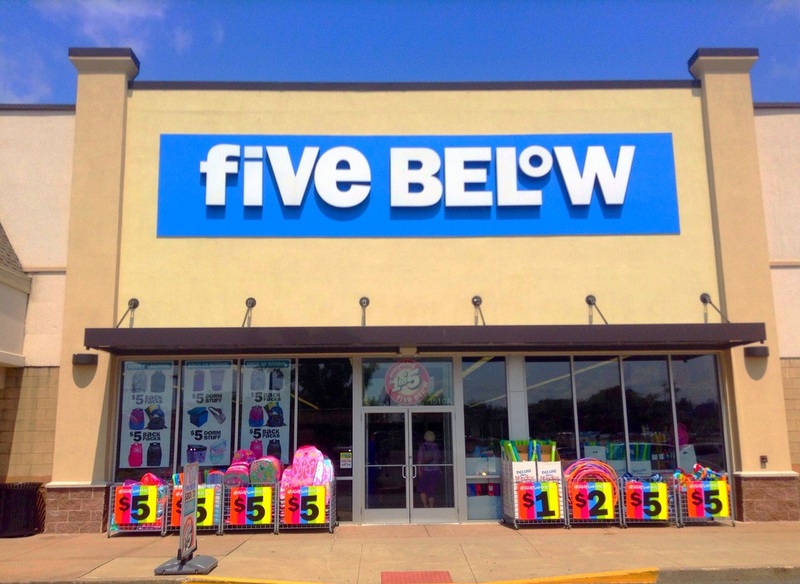 Praise goes out to the retail store, Five Below, for listening to my complaint and responding with speed and sincerity. It’s easy to stand out against just about all others in your industry by doing the simplest, easiest, most obvious, common sense things. Hi, I’m Andrew Mazer from small business university where the philosophy is one good idea can change your business and change your life. I’m going to tell you a quick story today about something that happened last night after I got The High Impact Marketing Newsletter by Mike Capuzzi. I’m a member of his high impact marketing club and Mike is a friend of mine and a very good marketing brain. His stuff is really, really good. And when I get the newsletter I try to set aside some time to go through it right away. It’s several pages and it’s very, very valuable. So I decided to take the kids out for water, ice and bring the newsletter with me, and while they ate their water ice, I’d sit on the bench and go through some of the newsletter. And so the kids decided that, since Five Below, a discount store that has mostly a kid’s stuff in it, they decided to trade their opportunity for water ice to go to Five Below and get a treat there. So we walked over to Five Below and , my daughter picked out something and, my son changed his mind, decided to go back for water, ice. But anyway, we got to the counter, the guy took our money and , gave me the change in the receipt and that’s it. No, “thank you.” And that is like my biggest pet peeve, I think, whenever I go to a place and they don’t say thank you when they take your money…when they take my money, it really, really pisses me off. I mean, every cashier, every owner, every manager should train their cashiers to say thank you. And it really makes me crazy when the owner doesn’t do it. But it’s crazy. You’re supposed to. I mean, they look at you like you’re supposed to thank them for buying something at their store. Man, that drives me nuts. And the real irony is that Mike Capuzzi was talking about mistakes. Look at the headline, Do You Make This Mistake in Business? And he talks about a bunch of mistakes that people make in their business. This is like the one that I hate the most-when people don’t say Thank You. So it was really ironic that this newsletter came at the same afternoon I had this experience. And so, when I got home I went onto the Five Below website and I just had to get it out of my system. So I dug in and I found a place where I could contact consumer affairs desk or, or whatever they call it. And I sent an email and I told them that I must have been in their store 50 times, and I don’t think anybody ever said thank you when they took my money. Now I didn’t do it for the gift certificate. I’ll take the gift certificate, but it didn’t do it for the gift certificate. And I’m not telling you to do it so you can go get a gift certificate. But I’m telling you that number one, if you’re in the restaurant business, the retail business, any kind of business, were you dealing with the public…if you don’t take a moment to make some eye contact and say thank you or send a thank you email or a thank you card or something, you’re leaving something on the table. I think a lot of people may be numb to it now. They don’t even expect a thank you. So even if you do give a thank you and they’re not expecting it, you’re a leg up on most other businesses out there, so I highly recommend you do everything you can to thank people for giving you money. Okay, so please, business owners get with it. The least you could do is say thank you when somebody gives you a piece of business. I always say one good idea can change your business and change your life. And this newsletter is always full of good ideas and just being in Mike Capuzzi’s world will definitely introduce you with a bunch of good ideas. So that’s it for today. I hope you enjoyed this episode. Sign up for The One Good Idea Newsletter so you never miss a valuable article, video, or idea. www.smallbusinessu.org . Check out the blog and catch you next time. Thanks for watching and reading. Share this with a friend and on your favorite social media spot. Your customer is pissed off. Somebody messed up. The order is wrong, someone lost the reservation, under cooked the pasta, over cooked the steak, the delivery was late, you shipped the wrong item, or otherwise just screwed up the customer experience some way. There’s only one thing you can do…only one thing you can say to quell the anger. 9 times out of 10, the customer’s anger and hostility will be instantly diffused and replaced by appreciation (and sometimes even a little guilt about their angry or confrontational behavior). I’ve been in business for 32 years. I’ve made my fair share of mistakes as have my employees. I realized early on how effective this statement is to resolve a situation. Mistakes Happen and Everyone Knows It. Integrity Wins Admiration. The customer is usually taken aback, both surprised and pleased with your honesty and integrity (which is rare). We are sometimes too eager to defend ourselves, but coming with this sincere and apologetic response, the customer’s offensive softens drastically. The next thing you say is, “How would you like me to resolve this for you?” Then listen. Usually, the customer’s proposed resolution will be reasonable, and sometimes less than you were even prepared to offer yourself. However, in most cases, 9 out of 10 or better, “I take full responsibility” will be resolution-enough. You will have a customer who admires you, feels good about the transaction after all and will likely patronize you again. You may potentially end up being publicly praised in the form of a positive online review for making good on a bad situation. 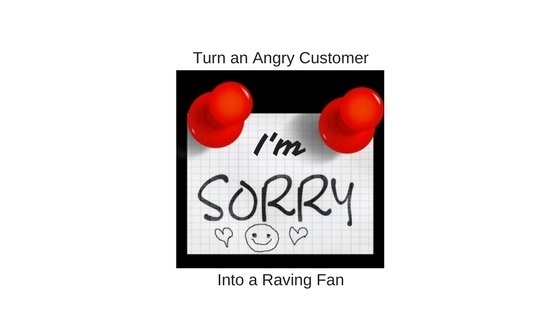 Want to turn an angry customer into a raving fan? Never make excuses. We all make mistakes. Even if an employees make a mistake, it’s still your responsibility. Saying so and taking full responsibility shows your leadership, strength, and integrity…and everyone admires these traits. Do you have a comment or a story to share about this topic? Share it in the comments section below. Want to get more small business management and marketing insights? SUBSCRIBE TO OUR NEWSLETTER. Getting your business noticed in a world of heavy competition is actually easier now than it has ever been in history. Everyone, whether you’re a business owner, a professional, or just a regular citizen, we have the ability to create our own broadcasting channel. One word says it all: CONTENT. Creating useful content your potential and existing customers will appreciate is it direct route to breaking through the noise, getting noticed, and creating an audience. Did you ever think you would be in the information marketing business? Probably not. But read on! My best suggestion is to look at your website as an information delivery system, not just an online ad where in inform and educate your potential customers. You may be thinking, “How can I create content for my website? Why would anyone care about my content?” Here’s my response: Whatever you make, do, or sell in your business, whatever services you provide, there are people out there looking for it online. First, they’re looking for information about it. By providing information, you become visible (they land on your website). By providing helpful information, they begin to trust you. By being genuine and not delivering a sales commercial, they begin to trust you. 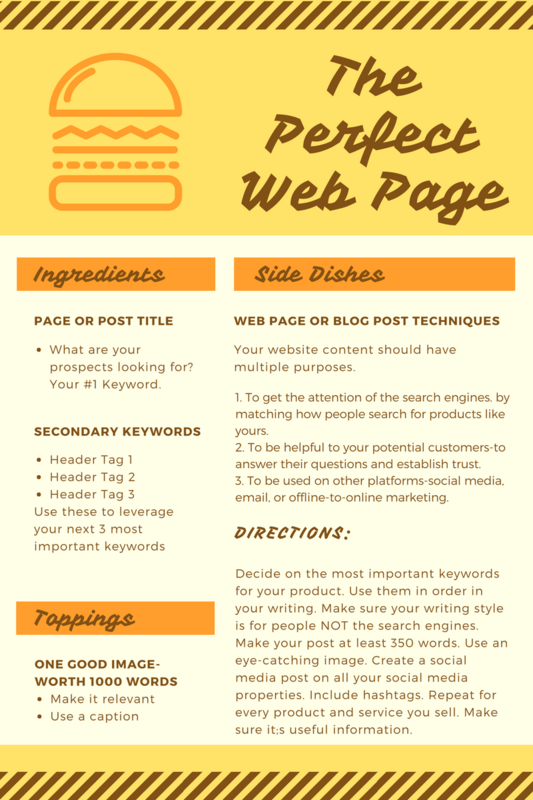 Create a web page or a blog post (like an article) about every product or service you make or sell. Describe it, in every detail. Describe the type of customer’s who buy it or use it. Describe the features and benefits. Not only will this help the customers to understand what you’re doing and selling in your business, it’ll also tell the search engines (this is a natural search engine optimization process) so your business will become more visible when someone is looking for a business like yours. The more you imitate real-world media, the more your content will be seen. Think about TV shows and radio shows. They are consistent. There are weekly shows and daily shows. They are aired consistently on a schedule. In the Information Age, even small businesses can leverage information to make acquire new customers and make more sales. Getting noticed means creating useful material on a regular basis. Some businesses will do this. Some won’t. The ones who do will benefit. Aside from written content, I also recommend video. Video is as simple as looking into your webcam and talking. There’s no need for high-tech equipment. You can always move up into better quality equipment later but cheap equipment today provides very acceptable quality. I started creating demonstration videos for products I sell in my wholesale business in 2011. In that time, my videos have accumulated more than 1 million views. Considering some videos go viral and can get a million or more views in a week, 1 million plays in 7 years seems like nothing. BUT, these videos have resulted in helping me sell hundreds of thousands of dollars worth of product and driving tons of traffic to my website (Mazerwholesale.com). My point is, all content has the potential of getting you new customers and real sales…so it matters. A YouTube channel is free. Uploading videos to YouTube is free. People love to consume information on video. YouTube is the second biggest search engine right behind Google. If your videos include information that people want to know about, your videos will be viewed. If you do a good job with your video then people will visit your website. Your videos and your blog posts make terrific social media posts. Now you have a blog post with a corresponding video and then you use social media to syndicate that content. The best time to start blogging and creating videos was about 15 years ago. The second best time is right now. There will never be less competition than there is right now. My best suggestion and what I do every just about every day is write down ideas for new content. 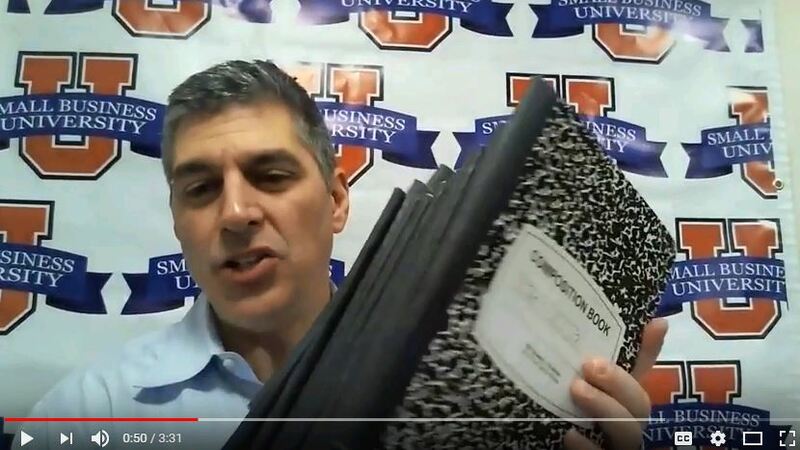 Every time I read something in a book or an article or listen to it a podcast that I think is share worthy, I write it in my notebook for later consideration to share with my audience. It’s as simple as that. You don’t have to have 100% unique thoughts or ideas. Be real, be yourself, and deliver information you would want to have delivered to you. Be valuable and people will pay attention. This is how you get noticed in a world of competition. This is how you become a thought leader. This is how you get to be known, liked, and trusted in the marketplace. You will of course need to make your content interesting and useful. Written, audio or video content is not about making a commercial message for your business, but rather it’s about value. Providing good, useful information is the only content you ever want to post online. Need help with content marketing plans and ideas? Let’s talk. Start here. Ask Andrew. 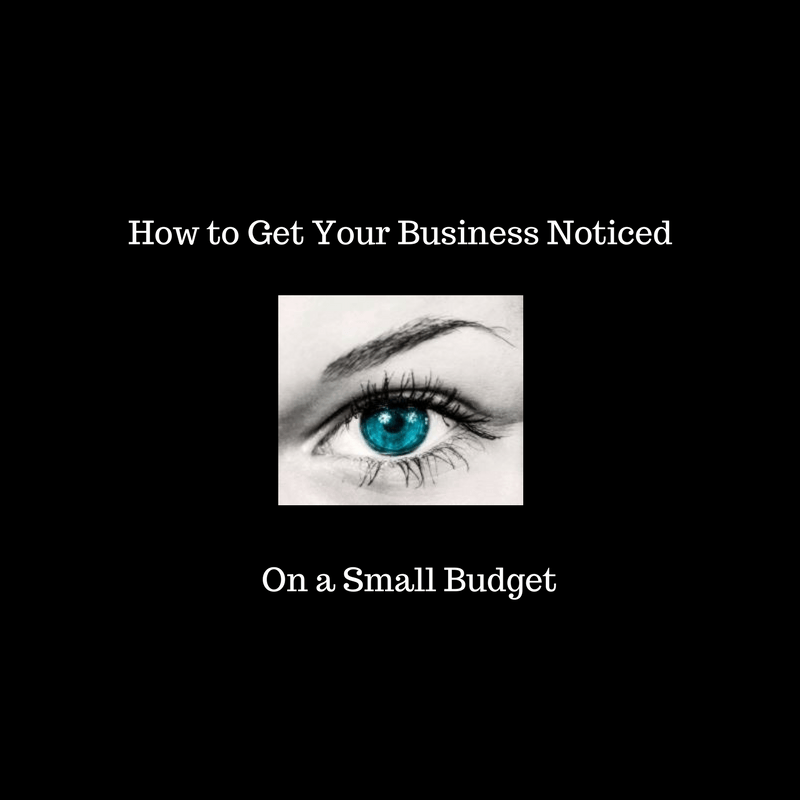 If you liked this article and you want to get notified when new small business marketing and management articles are published, CLICK HERE. It’s the New Year and a typical time to think about how this year will be different and better than last year. For a few of us, being more organized ISN’T on the list. For the rest of us, it is (or probably should be). I am admittedly NOT the organized type and I really don’t ever expect to be. I know my disorganization is part of my personality type (thank you, Kolbe Personality Type Index), but I also know my disorganization wastes a lot of my productivity time, adds to frustration, and a boatload of negative self-talk. This technique I just heard about seems like something I should try. Seems good enough to share too. The reason I’m sharing it in a post is largely because it puts me on the spot to stick to it…a sort of public accountability. Try this Simple Organization Technique With Me. Who’s In? I don’t know if it has a name but I’m going to call it the One-Minute Rule. Whenever there is a potential for getting something done in one minute or less, just do it now. It could be as something as simple as hanging up your coat opening and acting upon a piece of mail or writing a check. Don’t get me wrong, I’m a big believer in budgeting time for eliminating like tasks. In other words, set all the mail aside for a few days and then tackle the whole pile in one sitting. Batch anything that is repetitious or similar is time-efficient. 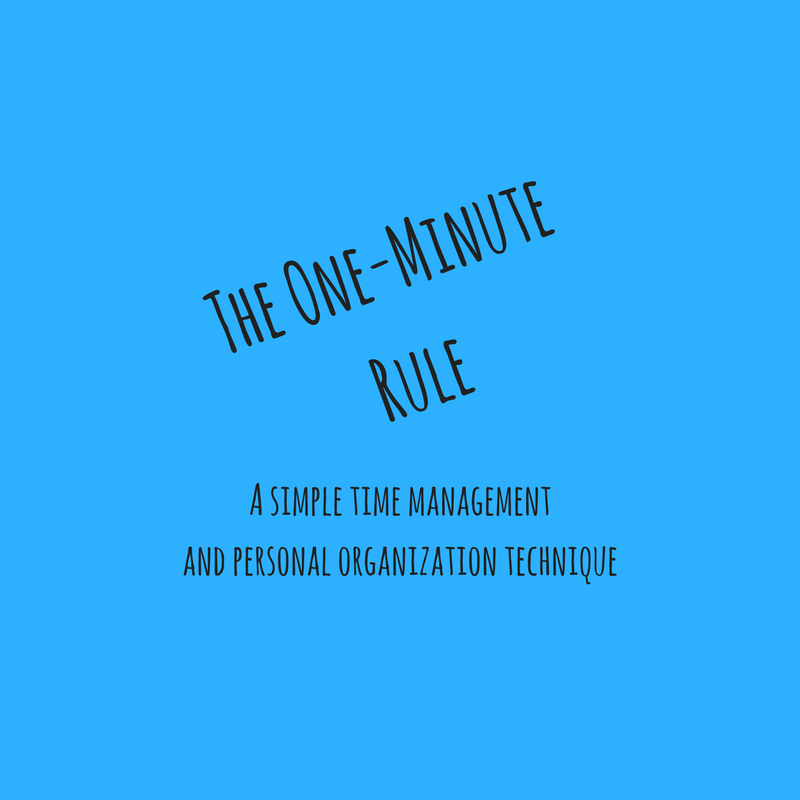 The One-Minute Rule applies to things which stand alone or tend to be the first thing in a potential pile. And that’s why this strategy appeals to me. I’m not sure I’m going to fall in love with this but it seems sensible enough to try and to suggest. Perhaps I’ll get back to you in a month or so and let you know how I make out. If you happen to try this and have any comments about your success or lack thereof then please do let me know how it went for you. BEFORE clicking on that Facebook tab, take a moment to look or think about how you could invest One Minute to declutter or take some positive action. How will THAT affect your productivity? This could be a big swing in terms of time wasted vs. time invested. I imagine repeating this exercise and the positive feelings we’ll get from it 3-5 times a day will be good for mental health while also delivering the benefit of a more productive day and a clearer desk. Will you join me in applying the One-Minute Rule? Leave a comment below. I’m Andrew Mazer and I’ve been serving business owners my entire adult life. I started my own wholesale company, Mazer Wholesale, Inc. in 1986 when I was just 21 years old. This business still exists today. I learned how to successfully market my business and products online and eventually began helping other business owners in various fields do the same. I’ve help restaurants, hotels/motels, service companies like massage therapists, electricians, garage door repair companies, venture capital money lenders, law firms and more leverage the power of the web to get more customers and make more money. SUBSCRIBE TO MY MONTHLY NEWSLETTER, CLICK HERE. 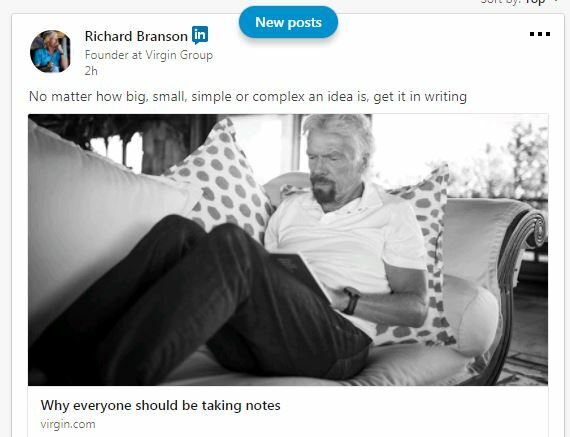 When I clicked on to LinkedIn today, the first thing that popped up was a post by Richard Branson. The article was about taking notes. He says if it were not for the notes that he took throughout the course of his career he would have lost the ability to take advantage of numerous opportunities. Ideas are fleeting. They can slip through the cracks so quickly. Yesterday I heard that the human brain can only capture the equivalent of about a Post-It note’s worth of information at any given time. In a typical meeting or conversation with a person or a group of people the topics and ideas can bounce around by the dozens. Good ideas can just evaporate so quickly. Subscribe to my One Good Idea Newsletter where I provide small business owners with actionable ideas you may have there thought of. One good idea can change your business and your life…it happens all the time! CLICK HERE. Branson’s article validated me in a certain sense because I’ve been carrying around an old fashioned marble composition book everywhere I go for about the last 15 years. I have hundreds of these books filled with notes and ideas and daily journals and customer orders and email addresses and all kinds of other information. I’m kind of proud of this and today a multi-billionaire validated my habit and routine. I’ve been hearing a lot about the word habit lately. Habit being more important than motivation or discipline. Discipline creates habits and habits are what creates consistency in behavior and, therefore, success. Habit, NOT discipline, is the key to the biggest successes. I believe my habit of rising early has made a massive difference in my success. I DO have the habit of taking notes. My weakness is in reviewing them. I’m determined to make a habit of reviewing my days. To come public with my thoughts and feelings and notes on this subject, it’s my intention to make it a public announcement so that it will help me with the discipline I need to continue the good habit of taking notes but also forming the habit of reviewing them and acting upon the good ones. These are not only the stepping-stones to building my business but they are also the Mosaic of much of my life. Who knows, maybe they will come in handy for my children and even my grandchildren. I believe that would be my greatest gift and legacy. Not a bad aspiration, if I do say so myself. I’m Andrew Mazer and I’ve been serving business owners my entire adult life. I started my own wholesale company, Mazer Wholesale, Inc. in 1986 when I was just 21 years old. This business still exists today. I learned how to successfully market my business and products online and eventually began helping other business owners in various fields do the same. I’ve help restaurants, hotels/motels, service companies like massage therapists, electricians, garage door repair companies, venture capital money lenders, law firms and more leverage the power of the web to get more customers and make more money. I would like to share my wisdom and experience with you if you will SUBSCRIBE to my One Good Idea Newsletter. Want to build website pages which get seen and visited by new customers? Follow this recipe and study the posts and pages on this website. Need a pro to do it for you? CLICK HERE. The web is where your customers are so: whatever you make, do, or sell, there’s somebody looking for it online. If there’s not, you probably better look for something else to make, do, or sell! So if you want people to find you and your business online, there are lots of ways to do it. At the core, you’re going to have to build a website and provide useful, purposeful content. The words, sentences, images, and the structure is what makes up the content of your web pages and website. When a website contains information which matches what people are searching for, it will often rise to the top of the search. Getting the “click” is your big opportunity to land a new customer. What do you sell? Whether you sell physical products, services, or even advice as a consultant or a coach may do, you’ve got something to sell. These are products. Each and every product you sell should be thoroughly explained AND demonstrated on its own page on your website. If you need more clarity or help with this, feel free to contact us. CLICK HERE for help with website content marketing. Most businesses don’t go very deep into detail about every product or service on their website. Why? Because it takes time, effort, and work. Also because they don’t understand this very important strategy called Search Engine Optimization which I’m teaching here in this post. Making the perfect web page to get your products and services discovered is simply demonstrated right here on this page. Follow this model. You found this page in your search of the question you typed into the search, haven’t you? Website content which is helpful to your human audience, written naturally and formatted for easy reading is also content which is rich with keywords which gets the attention of the search engines. This is the fuel which makes your content, your website show up in the searches. Thus, you get traffic to your website and the opportunity for gaining customers. When the words and sentences on your website closely match the language people are using in their search, the more likely your website will rise to the top search results. The more you tell, the more you sell. This is the wisdom of writers of sales copy for at least the past 100 years. There are people looking for very specific information. The more specific and the more detail you provide (the more you tell), the more likely your message is going to answer the question people are asking when they inquire in an online search. Although there may not be thousands of people every day in search of “the best blueberry pie in South Jersey,” if a restaurant or a diner were to thoroughly describe their desserts, include a photo, and tell where people come from to consume these desserts, they could imitate this strategy and surely land a few extra customers over the course of time. Even if the restaurant didn’t land new customers on the chance they were having an uncontrollable urge for a certain dessert or dish, if the web pages showcasing each menu item were helpful to the customers, this is still a worthwhile endeavor. Serving the customers well is always going to be a payoff. Building a continuingly growing and expanding website filled with all this detail, certainly catches the attention of the search engines and increases its chances of higher positions on the search results. To provide a model for getting your business, your products and your services to rank high in the search results when potential customers are online and searching for what you’re selling. For making OUR website show up in the search when people are looking for online marketing and search engine optimization tips. For demonstrating OUR expertise because even if we teach you how to do this, in all likelihood, most won’t make it the priority it should be…and therefore, you will feel comfortable and confident in hiring us to do it for you. Give every product and service it’s own page on your website. Use 350 or more words and at least one image. Do a bit of keyword research. You need to understand and use the terminology of the customers, not necessarily the words used within your industry. Focus on the most important 3 keywords and phrases using the page title, H1, H2 & H3 tags to separate and organize your text while also emphasizing your keywords. Need Help With a New or Existing Website? Fill Out This Form and Let’s Discuss It. Join the Small Business U Facebook Group, click here. “Advancing the ball” is an important strategic component in football. The objective in football is of course to score a touchdown, or at least get into the other teams territory close enough to score a field goal. These are the objectives of the offensive team. However these objectives are generally achieved incrementally. Individual plays are designed to move the ball forward but not necessarily to the goal line every time. Even though each each play does not result in a score, each advancement of the ball and improvement of field position is important and valuable. It’s a reminder that among all our activities each day, we need to make sure some of them have the potential to “advance the ball”. The items on our to do list are not all of equal value. Some of them have little or no effect of advancing our ball and some of them do. So it’s important that when we make our to do list that we designate major time on the highest value tasks. We need to certainly make sure that each day, our to do list includes at least one or several activities which will move the ball forward toward our goals. Then list 2 or more of those things and get them done. Even better! Advancing the ball, career-wise, requires major time invested in marketing ourselves, our products or our services. Another is learning how to market ourselves, our products and our services better than we’re currently doing it. Whether that learning is how to communicate better, how to improve our networking skills, how to be more organized, or how to make better use of technology, for example, these ARE “ball-advancing” activities. As the saying goes “time waits for no man.” The clock is ticking. Productive days build upon one another. Unproductive days just run out the clock. We don’t need to score a touchdown every day but for our career, our personal goals, and for our mental attitude, it’s really important to accomplish at least one valuable ball-advancing advancing action each day. It’s very important for the psyche. Stand out by adding content. I tell my marketing students (business owners learning how to market their business online) to add content to their website regularly. Each piece of content in the form of a blog post, article or new web page they create adds up to building a bigger, better online presence. They can be repurposed for their social media and other marketing efforts. One piece of content generated per week can yield a couple hundred individual marketing actions and touch potentially thousands of people (prospective customers). At the very minimum, adding one piece of content to a website each week ads 52 additional website pages per year. If you’re website grows by 52 pages per year and your competitors website does not grow at all this is a great advantage. If those 52 pages per year are repurposed for other marketing actions then the advantage is multiplied. Creating “ball-advancing” content even if you don’t have a website. You don’t have to be a business owner with a website to take advantage of this strategy. You can write articles on article sites such as ezinearticles.com. You can write blog posts on LinkedIn. You can create a YouTube channel or even a podcast. There are all kinds of platforms for you to showcase your smarts, your talents, your products, your services, and your value to the marketplace. Sometimes, plays designed for short gains break wide open and the gains are much larger than expected and can even result in a score. Multitasking is a lie. It doesn’t exist. At least not in the form which we refer to it most. Yes we can walk and talk at the same time and we can chew gum and write in our notebook at the same time and we can drive our car and talk and listen to the radio but really we cannot do anything which requires attention and concentration at the same time. 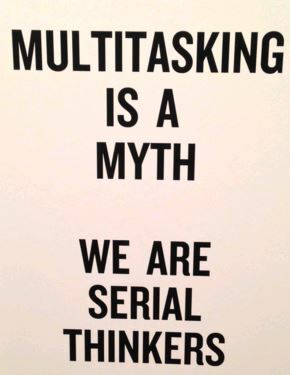 Don’t fall for the multitasking myth. It will never serve you well. Brag about being a good multi-tasker? Prove it. Studies show quality and productivity of “multi-taskers” never outperform focused attention on one task done at a time in succession. You are really not doing more than one thing at a time. You’re actually bouncing between two or more things but you’re not doing anything at the same time. Bouncing around from one thing to the next reduces your effectiveness and your concentration and robs any chance of gaining momentum which is essential for quality work true productivity. Even the fastest and most powerful computers do not actually multitask. They switch. They alternate from one function or task to another. The faster the computer the less noticeable but it’s true. Even the fastest computers noticeably slow down when resources are burdened with multiple tasks. 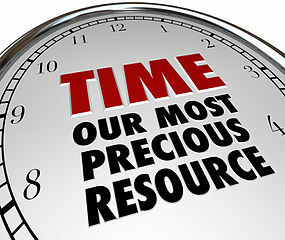 Time management and productivity are often on our priority list especially when it comes the turn of a new year. We invest in the next fancy calendar or other time management gadget with the hopes that this year we’ll figure it out and do better in this department of our business and our lives. The Answer to Time Management and Productivity Lies in Behavior. Concentrated focus on the highest value task at any given time is the answer. “What should I be doing right now? What is the highest value, most important thing I can do?” Ideally, these should be planned out the night before so you will start the day ready for action. For business owners, marketing or selling your product are generally the highest value task in your business. Of course it is not the only important task which needs to be done but it is the highest value most of the time. Tackle the highest value task then move on to the next highest value tasks. Concentrated focus on the highest value task will put you on the fast track to being as productive as you can be. Being as productive as you can be by prioritizing and working on your highest value tasks will put you on the fast track. Not only will this put you on the fast track to greater achievement and more success but it will also make much of the lower value tasks which you normally get into less necessary or even unnecessary. They will either become unneeded or easier for you to delegate. More focus on the highest priorities is more effective than multi-tasking. When delegating becomes more valuable than doing, then delegating will be on your hierarchy of priorities. Learning how to give $10 an hour work to $10 an hour people instead of doing it yourself will become almost like an income stream because you’ll be able to focus even more on highest-value stuff…which is usually more enjoyable as well. By the way, taking rejuvenation time during your day is equally important. When you expend your highly focused energy on high value tasks, you need to replenish. You deserve a 10-30 minute wind down and a snack so you have the energy and focus for the next highest value task. This is easy to understand but not easy to do. For most of us, it requires a change in habits which is a worthy topic for another article. A huge mistake I see businesses make is a failure to connect their offline marketing to their online marketing. What do I mean by that? It will be easier to explain when I give you this example of a postcard I received in the mail a couple days ago. I received a postcard mailing from a senior care facility. I presume it’s because I am in my early fifties and the assumption is that I have aging parents, which I do. So I am on some kind of list of prospects to eventually be shopping for a senior care facility for a parent. This makes a lot of sense. What does not make sense is that this postcard had only a phone number and the names of 2 contact people and did not have the company website on the card at all. What’s the trouble with this? A website is there to do the heavy lifting a small postcard cannot do. A website has unlimited space to go into unlimited detail about the place, the product, the people, the features, and the benefits. Look at the ads in most print publications. They seldom use Landing Pages and this is an epic mistake. The biggest failure of this and the bigger lesson as it relates to offline to online marketing is that there is no attempt to capture someone’s contact information who may be interested but not ready to make a decision right now. I would venture to say that would be the majority of people receiving the postcard. The solution to this failure would have been to have the website address of the organization and a special page on the website which is specifically created to work in tandem with the postcard. It would look something like this: www.oldageplace.com/freereport. This is called a LANDING PAGE. With a couple hours or so of work, this lead generating procedure could possibly create dozens or even hundreds of those postcards which were probably sent out to thousands of people into solid leads. Anyone choosing to download these free reports would be an obvious prospect. With this list of their names and email addresses they could be on a list to receive information and reminders indefinitely. It’s what you call a highly-targeted list. The postcard mailing is fairly-well targeted, however, it’s a one-shot deal. It’ll be in the waste basket except for the tiny percentage for which it may be exactly the right thing at the right time. When you send an email to the people who requested a free report once a month with a single idea or tip for caring for their elders, this organization would be always in top of mind position and also be regarded highly because of their expertise and quality information. Even further the law of reciprocity could become involved considering the good value this company provided prior to ever collecting a single dollar. I see business is all the time advertising in print an expensive magazines. In Philadelphia there is Philadelphia Magazine. In South Jersey, there is SJ magazine. These are the magazines which I see because I live in South Jersey. I’m sure there are major magazines in most metropolitan areas. Ads in these types of magazines are expensive. Yet I see most of the ads lack in advertising a landing page. Most businesses have the presence of mind to at least put their website address in their ad but actually that’s not good enough. It a landing page is much more effective than just sending someone to your home page. Any restaurant, law firm, dentist, spa, massage therapist, chiropractor…ANYBODY who has a website and is not leveraging the power of a landing page to capture contact information of their ideal clients is only using their website as a glorified business card. When you take your customer from print ad to website, to requesting information, you are essentially taking their hand and walking them to your cash register.